We have Integrated a feedback form that helps to send questions, suggestions or report issues quickly and easily. Together with your feedback message, our team can optionally receive a screenshot of the current workplace and basic system information. This helps to resolve issues with as few steps as possible. 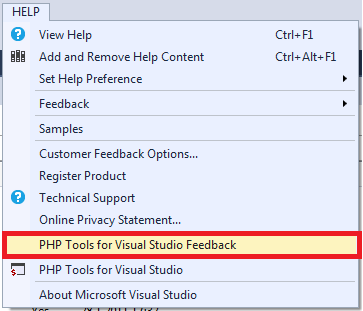 Please go to menu Help | PHP Tools for Visual Studio Feedback, and let us know what you think.